Couillon is a Belgian trick-taking game for four players in partnerships. In Couillon, players try to collect the most points by capturing high-ranking cards in tricks. At the beginning of the hand, the players get the opportunity to select a trump suit. If they do, they risk incurring a penalty if they fail to capture as many points as their opponents. Several variations of the game are played throughout the Low Countries. The object of Couillon is to collect the most points by winning tricks. Couillon is played with a 32-card deck. 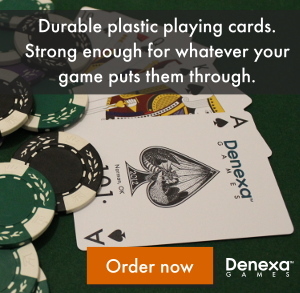 Starting with a deck of Denexa 100% Plastic Playing Cards, remove all of the 6s through 2s. You’ll be left with a deck that has ace through 7 in each of the four suits. You also need something to keep score with, preferably something that erases easily. 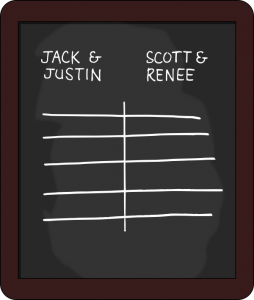 A small chalkboard or dry erase board is ideal. Draw a vertical line in the middle of the board, with five horizontal lines crossing it, as shown at the right. 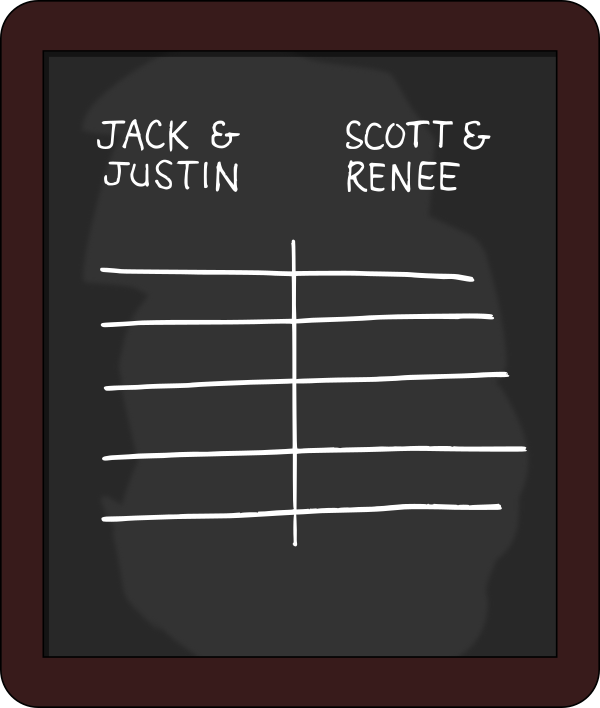 Label each half of the board as belonging to one of the two teams. Determine partners by any agreed-upon method, such as high card draw or even just mutual agreement. Partners should be seated across from each other, so that as the turn passes around the table, players of alternating partnerships will be taking their turns. Shuffle and deal four cards to each player, two at a time. Place the eight-card stub in the center of the table. Then, turn the top card of the stub face-up. The suit of this card (referred to here as the upcard) is a potential trump suit. The first order of business is to decide on what the trump suit is. The player to the left of the dealer may either accept the suit of the upcard as trump or decline it. If they choose not to accept it, the turn passes to the left, and the dealer’s partner then has the right to accept or decline it. If all four players reject the upcard as the trump suit, turn up the bottom card of the stub. This suit then becomes the trump suit. The player to the dealer’s left leads to the first trick. Each player in turn, going clockwise, contributes one card to the trick. A player may play a trump to any trick. If they do not have or don’t want to play a trump, they must play a card of suit led, if able. Only if they have no cards of the suit led may they play any non-trump card they wish. The highest card of the suit led, or the highest trump if any were played, wins the trick. 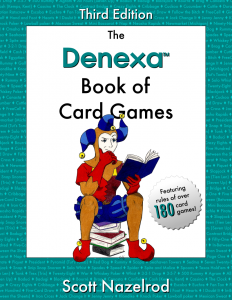 (Aces rank highest, and all other cards follow their usual order.) Won tricks are not added to the hand; instead, cards from won tricks are placed face-down in a pile. Both partners from a side share one pile. After all four tricks have been played, both teams tally the point values of the cards in their won-trick pile. Aces are worth four points, kings are worth three, queens are worth two, and jacks are worth one. Tens and nines have no point value. Whichever team collected more points wins the hand. They erase one of the lines from their half of the board to record this. If the side that accepted trumps lost, they add a mark to one of the lines. This line now counts double; to be erased, two wins are needed (one to remove the mark, and another to remove the line). If the partnerships scored an equal amount of points, neither team scores for the hand. Instead, the next hand with a winner counts double. The deal passes to the left, and new hands are dealt. Game play continues until one partnership erases all of their lines. That team wins the game.